When both the temperature and the humidity start to climb, the effects of the heat can be disastrous for pets and people alike. Hundreds of animals perish every year in the summertime, simply because their humans don’t understand how to keep their pets safe during hot weather. Learn the signs of heatstroke (hyperthermia) and what to do if you suspect your pet is suffering from heat exhaustion before you and your pet partake in any summertime activities! It’s important to remember that if your pet is overcome with heatstroke, you need to call your veterinarian immediately Even if you mitigate your pet’s symptoms and they appear to be doing better, heatstroke can claim a victim hours after their symptoms subside. 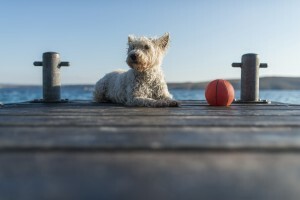 Now that we understand the dangers of hot temperatures, know that it doesn’t mean you can’t enjoy the summery season with your furry companion. So, how can you help your pet stay cool; while enjoying summer fun and safety? Plan outdoor activities earlier or later in the day, when the temperature is less intense. If the humidity is low but it’s still sweltering outside, tie a wet bandana or special chilling collar filled with gel-beads around your pet’s neck to increase evaporative cooling. Freeze low-sodium or sodium-free broth in ice trays to provide a chilly treat for your hot pup. Purchase a sprinkler or a child’s plastic play pool and install in your yard. Add only enough water for your pet to climb in and get wet and never leave your pet unattended around or in water, even if it is only a few inches deep! Invest in a squirt bottle or mister: wet your pet’s coat with water before leaving the house and several times during your outing, ruffling their periodically to help the water evaporate. Always have shade and cool water available to your pet, at all times. Dog booties or shoes aren’t just for snowy weather. Asphalt, sand and gravel, and pavement can get hot enough to burn your pet’s footpads. Test the temperature with your own bare foot if you aren’t sure — if you wouldn’t be able to walk comfortably for 30 seconds, neither would your pet! Keep your pet cool by regularly brushing them with an undercoat tool to remove excess fur. Don’t shave your pet without consulting a professional groomer; fur can actually help animals regulate heat and provides important sun protection. Cumulative sun exposure can cause skin cancer and cataracts, so limit your pet’s sunning whenever possible. Never use human sunscreen products on pets — they are poisonous when ingested (as with licking). Leaving your dog unattended in a car is never an option. Even if the windows are cracked and the car is parked in the shade, your dog could be cooked alive in minutes flat. Never assume that a dog innately knows how to swim; some pets have to learn to paddle, just like people. Don’t force or throw an unwilling dog into water! Dogs have been known to exhaust themselves while swimming and drown — always keep an eye on your pet and know when enough activity is enough. Be certain your dog knows where all exits are located, so they can vacate the water easily. If you are regularly swimming in freshwater with your dog, talk to your veterinarian about the leptospirosis vaccine. The leptospira bacteria live in freshwater, swampy areas, and puddles and can have dangerous consequences for an infected pet. Worried your pup isn’t the most successful of swimmers? Purchase a doggy life vest! Always hose your dog down after their swim, since chlorine can irritate their skin. If you’re ever questioning your pet’s safety at any point during your summertime outing, just remember: it’s okay to leave them in the comfort of your air-condition home! They’ll be more than happy to let you regale them with tales of your adventures when you return. For more information about cool summer activities that you and your pet will enjoy, give us a call. Now be safe and cool!